If you want a knitter to make something for you, there’s a few ways of getting what you want. One is to ask politely, saying please and thank you. Another is to offer money. A fantastic way to get a knitted thing is that breathless look of excitement at the thought of wearing it. That’s worth a lot. Pattern: Personal mashup including decreases from Halfdome knit in the round. There was some trauma in this hat’s life. I made it too long and had to rip out and redo the yellow section and part of the orange section. Found out I’m really good at weaving in the ends, and Lopi does not give up those weavings lightly. But it was ripped out, redone, and completed in the space of one day, and it’s a much better hat. Sometime very soon it will go to its owner, and there will be a picture of the look of "SQUEE" on her face. I’m looking forward to seeing that! This is not a pretty hat. It’s not a flattering hat. 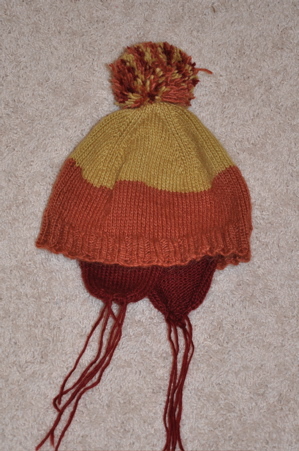 However, it is a warm hat, and it’s quick to knit. I might make one for myself, but without the earflaps and pompom, using the bulky weight Lopi yarn, and in very different colours. So not the same hat at all. I’ve not made one yet for my husband. Fortunately he doesn’t seem to be so interested, even though we both are huge Firefly/Serenity fans. I’ve a friend, though, who cranks them out like mad!